Were you aware that a significant portion of your energy costs come from the handful of hours each year that customers use the most energy? Everyone expects their lights to come on without fail no matter what time of day it is. This means utilities must build and maintain expensive power plants with the sole purpose to be turned on when electricity use is at its highest, which may only be for a few hours each year. Customers can save a significant amount of money if we can reduce those peaks in demand by using energy at different times of the day – and demand response is an important tool to do that. “Demand response” is a general term for rewarding customers with compensation, rebates, or savings on their bills in exchange for reducing their energy usage during times of high demand across a utility’s system. Electricity prices are highest during these high-demand times, because expensive power plants that only run for a few hours a year must be started up to meet demand. These “peaker” power plants are often more polluting, too. Peakers are generally less efficient due to the need to fire up quickly to meet demand. You might already participate in a demand response program. Many utilities in Minnesota offer A/C savings programs that allow your utility to shut off your central A/C for short periods. In return, you receive a discount on your bill. Demand response programs are also common for more energy-intensive customers such as manufacturers and large commercial organizations. These customers can achieve significant monthly savings by limiting their usage during periods of high demand. While an individual household won’t save nearly that much, as a group residences represent the largest electricity users in our economy (according to the U.S. Energy Information Administration). If you put all those homes together, that is a huge potential resource for savings. How can this benefit customers? 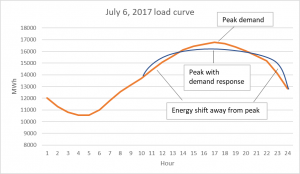 Limiting the peaks and valleys of electricity demand to create a more stable electricity load throughout the day can save consumers money in a few different ways. First, cutting the amount of electricity that’s needed during peak hours saves money and emissions on the utility’s system. It’s very expensive to generate power to meet the highest peaks of customer demand, and a significant amount of utility costs are driven by just a handful of high-demand hours. Additionally, peaker power plants are generally less efficient and more polluting than the average power supply, so reducing peak electricity demand can reduce emissions, too. Second, with a lower peak demand, utilities may not need to build new, expensive power plants that are only needed for a few hours a year to meet demand during these times. Many power plants in the U.S. are running at a fraction of their capacity. This makes up a huge portion of the cost for electricity for resources that are rarely used. Participants in demand response programs receive incentives to reduce their energy usage during peak times through compensation, rebates, or energy savings. Check what demand response programs your utility offers by taking a look at their website and see if you can participate. For example, if you have central air conditioning look for your utility’s A/C demand response program to save money in the summer. Xcel Energy customers who participate in its A/C Savers Switch program save 15% on their electric bills during summer months (June-September). Other common demand response programs include electric storage water heater programs or dual fuel programs for people with electric heat and a back-up system. Electric storage water heater programs are available for many cooperative utility customers in Minnesota. This program allows the utility to charge your water heater overnight when there is less demand on the system, to store hot water throughout the day. In return for participation, customers receive a discount on the electricity they use to power their water heaters. Customers with electricity as their primary heating resource and that have a secondary heating resource can receive a discount on the electricity they use for heating. Participants in this program allow the utility to interrupt their electric heating service during peak times where their secondary heating source will kick in. Utilities, required by state regulators and encouraged by advocates like CUB, are exploring how to do more to help customers shift their electricity usage off peak hours. We’ll keep you up to date as new opportunities arise.